Interact YGH: Have You(th) Got Heart? Cueing an onslaught of a sea of red and white, ‘Uptown Funk’ reverberated throughout the Atrium @ Toa Payoh Hub during the late hours of the bustling Saturday morning, 18th April. This attracted curious glances from casual passersby as enthusiastic jeans-clad students broke out into a flash mob. Indeed, the spirited showcase truly symbolized the essence of passion for service and volunteerism. 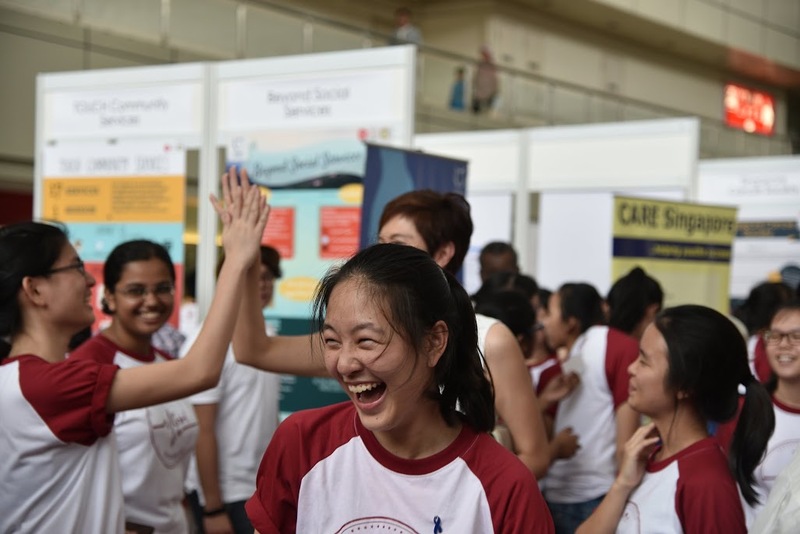 Over the course of the day, our Interactors’ infectious enthusiasm and exuberance drew many onlookers to take a peek into what Raffles Interact had in store for the day. 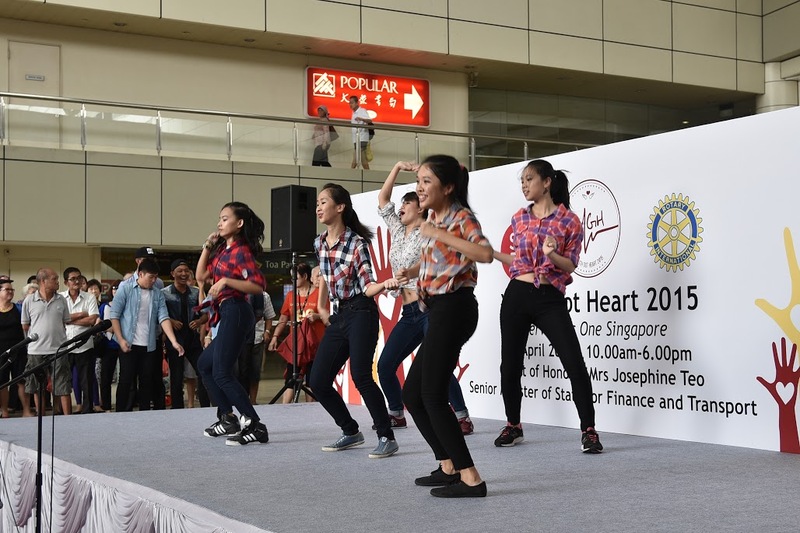 In essence, Youth Got Heart (YGH) is a highly-anticipated annual outreach event organized by Raffles Interact. Its main purpose each year has been to provide a platform for youths to find out more about volunteerism, as well as to seize the opportunity to give back to the local community in a meaningful way. With that in mind, the event showcased an extensive variety of VWOs, including The Nature Society (Singapore), Movement for the Intellectually Disabled of Singapore (MINDS), and Family Life First, The event was graced by the president of the Singapore Rotary Club and Mrs Josephine Teo, Senior Minister of State at the Ministry of Finance and the Ministry of Transport, as the Guest-of-Honour. 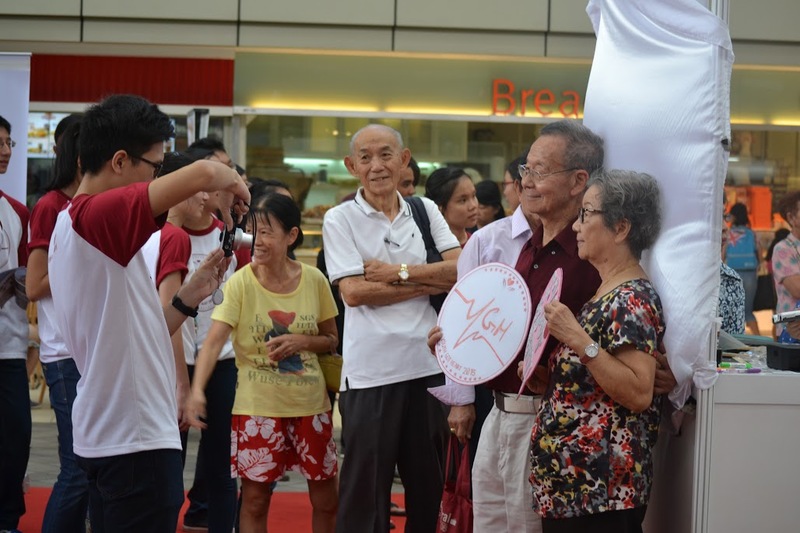 In commemoration of SG50 this year, YGH 2015 hoped to incite the collective spirit of Singaporeans to play an active role in contributing and sustaining service to the community under the theme “Past, the Present, and the Future”. The event’s programme for the day kickstarted with an address by Isabel Lee, the main student organizer of YGH 2015, who provided a few insightful words about her experiences with service. She elaborated upon her motivations for dedicating herself to such a daunting yet meaningful project and delved into the story behind her own intrinsic passion for service. This thoughtful address reached out to the audience and encouraged them to participate in service themselves. Interactors getting hyped during YGH 2015! In particular, the highlight of the event was an extensive array of informative booths, each representing a particular VWO that, with the combined efforts of all Interactors, were decorated with personalized infographic posters. The boothes communicated key details about service opportunities through engaging visuals and verbal dialogue with staff and interactors. Delegated Interactors and organization representatives were key to the event’s main objectives, as they provided detailed information about the available volunteering opportunities and the specific needs of each VWO. They were able to advise the public on the most suitable volunteering opportunities for them, according to the beliefs, interests, and schedule of potential volunteers. This was essential towards ensuring a mutually beneficial and ultimately rewarding volunteering experience for each and every one. The whole event infused elements of the Past, the Present and the Future, into its layout. The main attraction was a “Hall of Fame” exhibition detailing volunteering efforts of the past, informative booths representing the needs of the present, as well as photo-wall filled with polaroids to symbolize the hope of the youth for future volunteerism efforts within Singapore. Members of the public having their picture taken at the photo booth. Additionally, innovative station games, assembled for all to try their luck at, managed to entice participants to complete the entire course in order to win a special food pack. Sporting members of the public, ranging from gutsy aunties to ever-curious children, gamely tried their hand at searching for specific items in a Mystery Box while blindfolded, as well as drawing with their eyes closed– aimed at allowing participants to briefly place themselves in the shoes of the visually handicapped. Adding to the hype was a myriad of performances, ranging from a performance by alumni members from Raffles Street Dance’s energizing take on the pop chart-topper Bang Bang by Jessie J, Ariana Grande, and Nicki Minaj, to Raffles Rock’s assortment of tunes, including Pompeii by Bastille and You Only Live Once by The Strokes, as well as performances by the Interact Band, all of which kept the audience drawn to the atrium the entire afternoon. Raffles Street Dancers showing off their talent and skilful moves! Wahid Al Mamun, of 15A01A from Raffles Rock shared with us that “Personally, I found it cool that we got to take part in this community initiative as well as meet so many different people – volunteers, elderly, and to learn a bit more about other people’s lives.” Ernest Yee, a J3 graduated member of Street Dance, mentioned that he had simply hoped “to make everyone feel happy from watching our dancing” and had placed audience enjoyment as their top priority. To quote him, “we hoped the audience enjoyed it as much as we did!” Indeed, these talented performers managed to engage, delight, and amaze throughout the course of the day. We even had our very own Interactors gamely stepping up to the challenge of hyping up the audience. With engaging and charismatic emcees and Interactors spontaneously breaking out into dance to the beat of Bruno Mars’ Uptown Funk, showcasing their passion and spirit for volunteerism, it really added much vibrancy and energy to the atmosphere that afternoon. 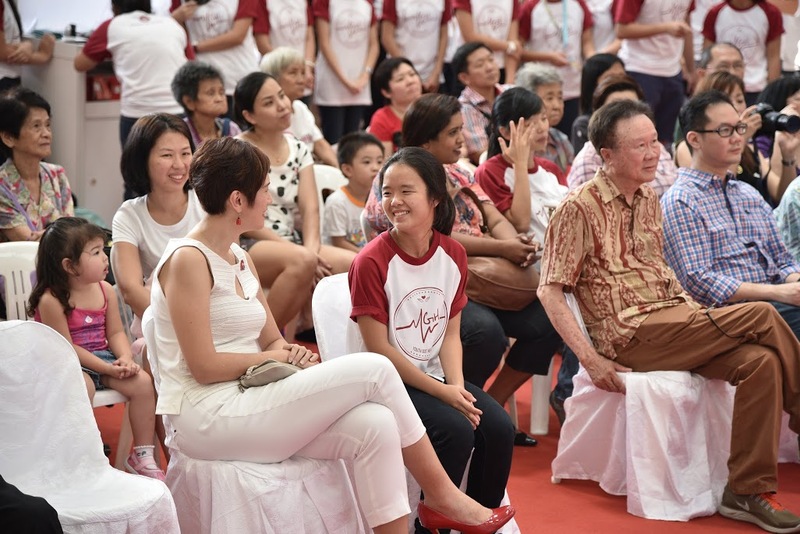 Throughout the day, it was heartening to see a fair share of individuals, who personally embodied community spirit and displayed the rarely seen kinder, more pro-active side of Singaporeans today. For example, we had Interactors dancing with some of the more spirited elderly folk who got off their seats to dance alongside the performers; and in another instance, members of the public were kindly reminding the Interactors to stay hydrated in the humid mid-afternoon weather. It was truly incidents like these that made the long day worth it. In retrospect, some members of Interact mentioned that they would hope to achieve a more balanced demographic in the future. However, given the location of the event, its sphere of influence and impact was largely limited to the significantly higher proportion of elderly visitors rather than meeting original expectations of engaging youths. Despite this minor setback, Youth Got Heart still undoubtedly helped to raise awareness and incite public support for a vast array of VWOs. All in all, 2015’s YGH was a resounding success, managing to connect dozens of potential volunteers to short-handed VWOs. 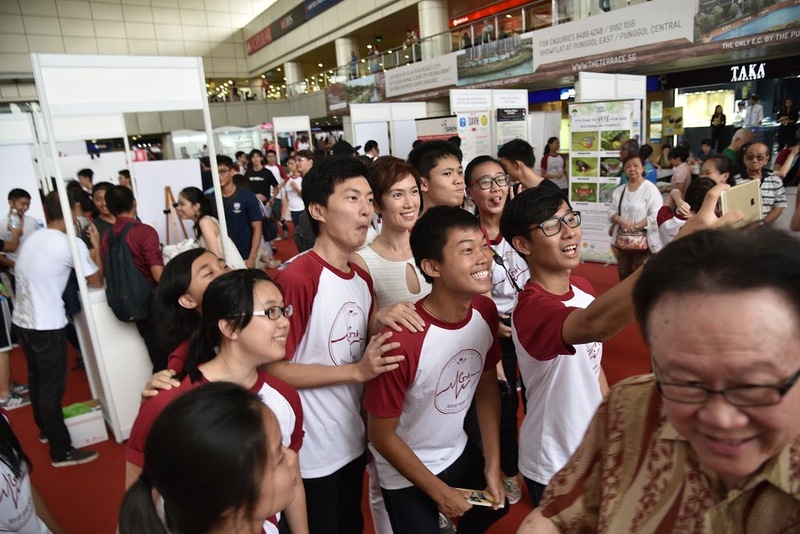 Selfie time with the Guest-Of-Honor, Ms Josephine Teo! Raffles Interact promises to intensify their efforts for next year’s YGH, so do keep a look out for more exciting opportunities to serve the community coming your way! 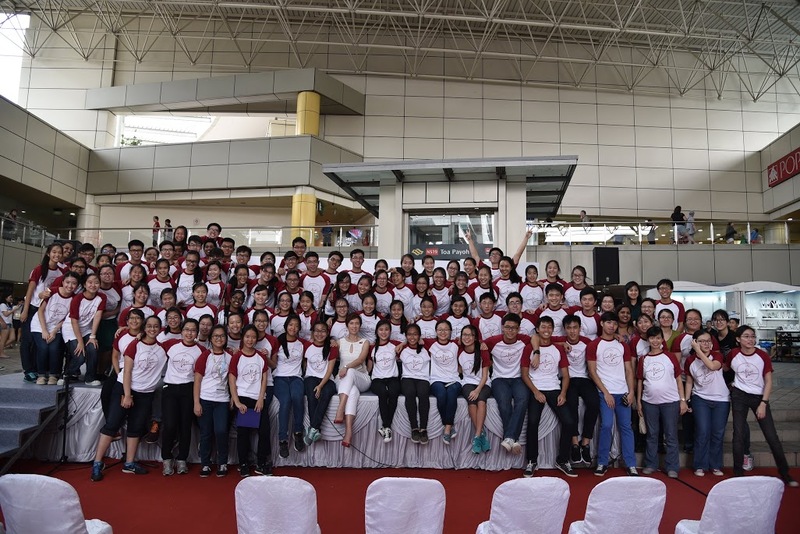 With your valued support and continued encouragement, Raffles Interact will strive to find more ways to connect youth to volunteerism and serve the community as well as the school. Interact ‘15-’16 would like to thank everyone who came down to show your support!